I liked this one too much to bury it in Sunday's leftovers. The eye is my most favorite subject to shoot. Well done! I like it too! Happy Friday, Carson! With the striking black background...lovely. That could win a big prize in a photo contest. Love the composition and oooooh those eye lashes! Stunning. Another special one to add to that gallery wall I want you to create. Have an awesome weekend. Hopefully I can get to the pool. The last two Sundays, we had monsoon type weather. Meaning we had all of 68 rain drops TOTAL; the weiner dog and I counted them. Sundays are my pool and reading days...usually. Love this one. Those eyes. Those ear feathers. Has to be Lucy. Love it! How did you compose it? 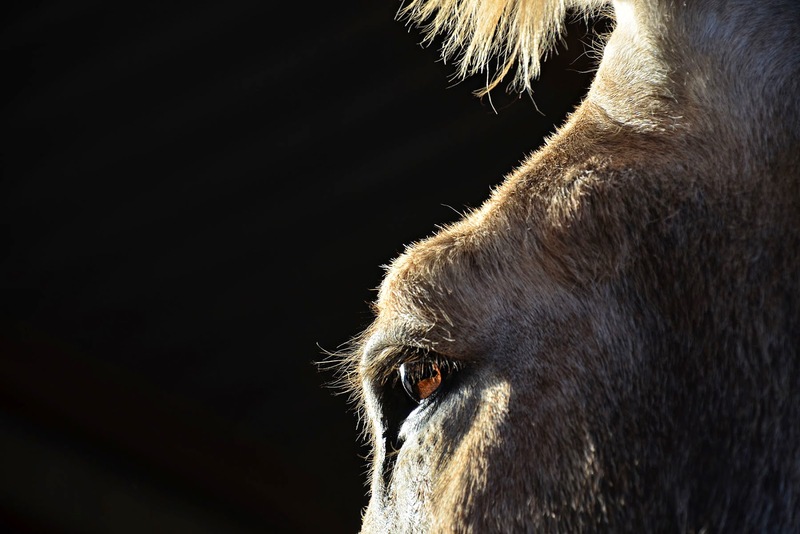 Lucy was standing in the barn, facing west and directly into the sun when I shot this. The area behind her was in total shadow, creating the dramatic contrast. that's awesome! I've been trying to get one like that for forever! Even with photoshop I can't get it quite right. Thanks.... I guess I'll try again!